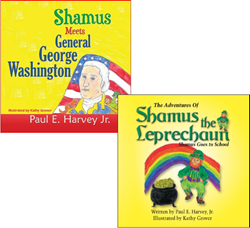 Paul E. Harvey Jr. is the author of stories that feature a charming Irish leprechaun named Shamus. The head custodian at Orchard Hill Elementary School in Montgomery, New Jersey, is none other than Paul E. Harvey Jr., a children’s book author of stories that feature a charming Irish leprechaun named Shamus. Harvey credits his publishing success to the mentoring help and support given him by teacher Kathy Grover, who works with him at the school. She also illustrates and edits his books. While Harvey possesses the creativity and imagination to write the stories, he is hampered by the learning disability of dyslexia, and he needed Grover’s help to make his writing a reality. When a leprechaun wants to teach history, pay attention! "Shamus Meets General George Washington" is a beautifully illustrated story that will fire the imagination and make young readers love history. The author asked himself, “Who’s better telling history stories than a wee little leprechaun who has lived for hundreds of years?” This is his second book in the Shamus series. It’s Christmas Eve 1776. Shamus the leprechaun and his flying dog companion Rocco enter General George Washington’s campsite. The general invites them into his tent to get warm. Washington shows Shamus his plans to cross the Delaware and attack the Hessians in Trenton the next day. Shamus and Rocco go along with the American troops to see history in the making. In his first book we meet Shamus, a cunning little leprechaun who loves nothing more than to spend his hours counting and polishing gold pieces. One day he receives a very important task: Shamus is asked to journey from home (and away from his precious stores of gold) to learn if humans still believe in leprechauns. This first book in the series does not disappoint. With a clever human disguise and a few leprechaun tricks up his sleeve, Shamus visits a school where he finds a surprise that is far more exciting than all of the pots of gold in the world! The energetic, high-spirited students at Harvey’s school were a source of inspiration for this book. SHAMUS MEETS GENERAL GEORGE WASHINGTON (ISBN: 978-1-63135-888-3) is now available for $10.85. THE ADVENTURES OF SHAMUS THE LEPRECHAUN: SHAMUS GOES TO SCHOOL (ISBN: 978-1-60693-924-6) is now available for $15.50. “We are pleased to announce the release of these wonderfully imaginative children’s books that makes learning fun,” said Robert Fletcher, CEO of Strategic Book Publishing and Rights Agency. WHOLESALERS: These books are distributed by Ingram Books and other wholesale distributors. Contact your representative with the ISBN for purchase. Wholesale purchase for retailers, universities, libraries, and other organizations is also available through the publisher; please email bookorder@sbpra.net.